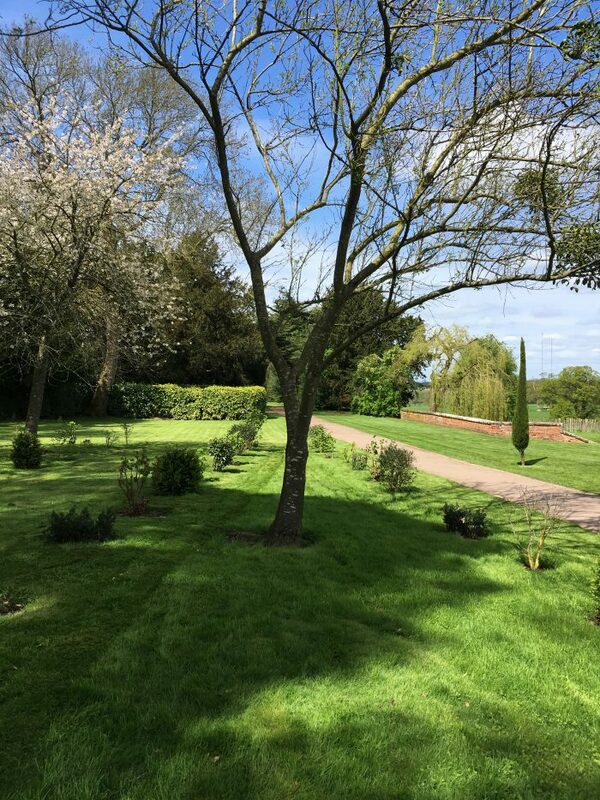 The gardener at Hanbury Hall was taking a short breather, contemplating how best to mow the triangle of grass so that the lines were straight and in keeping with the rest of the lawn. 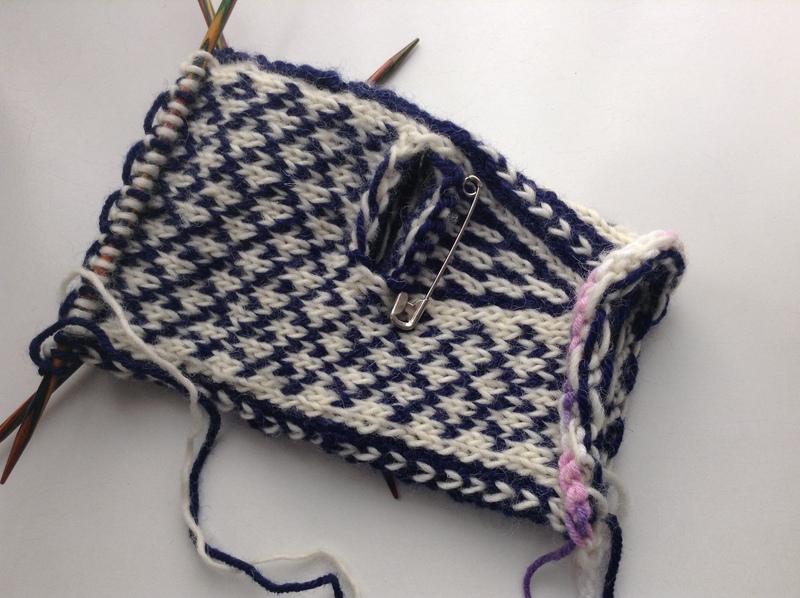 We had an interesting chat about the options and – being A Knitter – I suggested the principle of short row shaping, applying it to the grass scenario. I reckoned it would work pretty well! 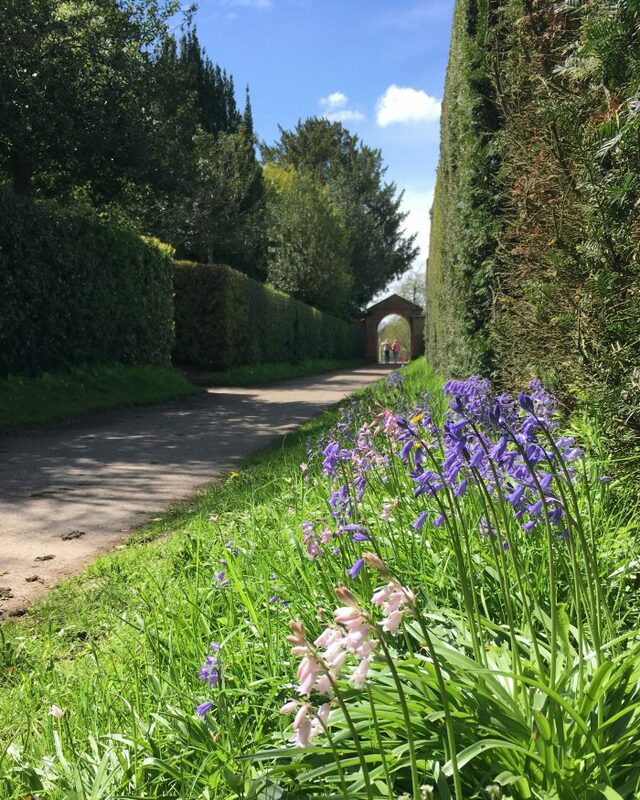 Elsewhere in the garden, there was more creative inspiration – the colours of the bluebells against the bright green grass stopped me in my tracks. 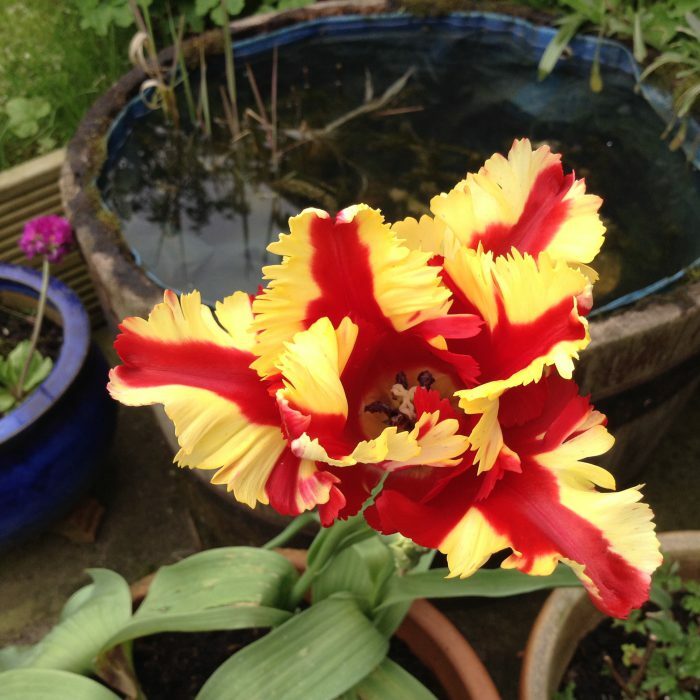 Back at home, the frilly edge of these tulips reminded me that I’ve been meaning to knit the Lintilla shawl by Martina Behm for quite some time. 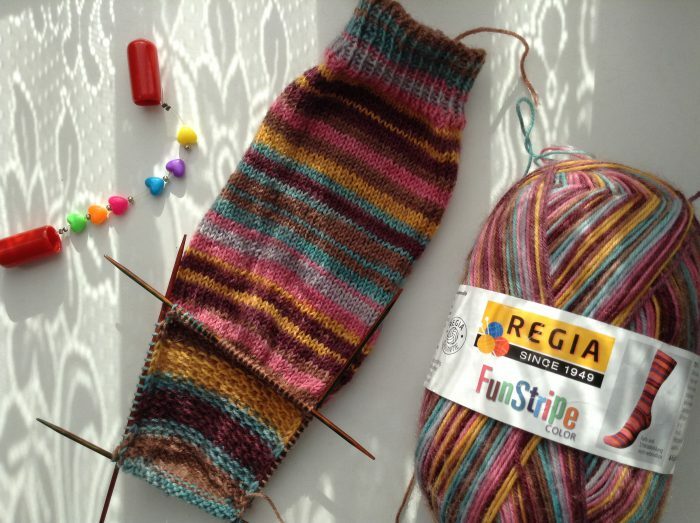 I’m sure I have some suitable yarn in my stash … albeit in a less striking colourway – I’ll go and have a look! 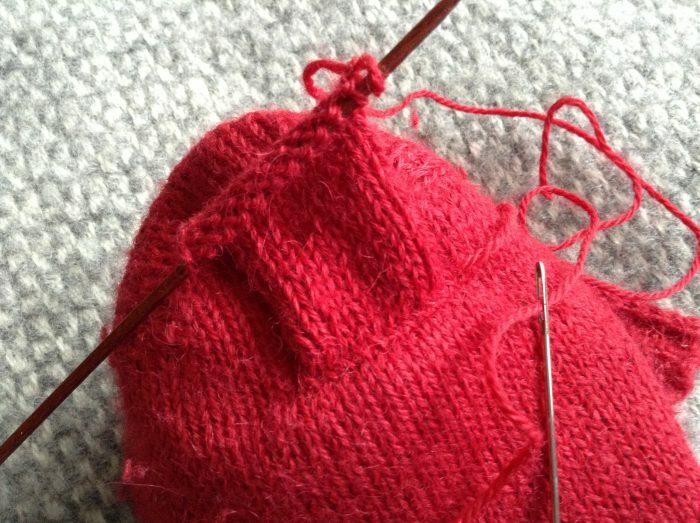 Has knitting cropped up in your conversations this week? I’d love to hear about it! This little project proved to be an unexpected challenge – pulling the stranded yarn tightly across the back of the work felt so wrong! Normally, stranded colour work requires a nice, even tension to stop the floats from pulling. Here, I had to make a conscious effort to pull them tight, in order to create the pleats with their insulating pockets of air, to keep the teapot warm. The pattern is Patons Classic Pleated Tea Cozy, a free pattern on Ravelry. The yarn is Stylecraft DK, unlabelled part-skeins from deep stash. 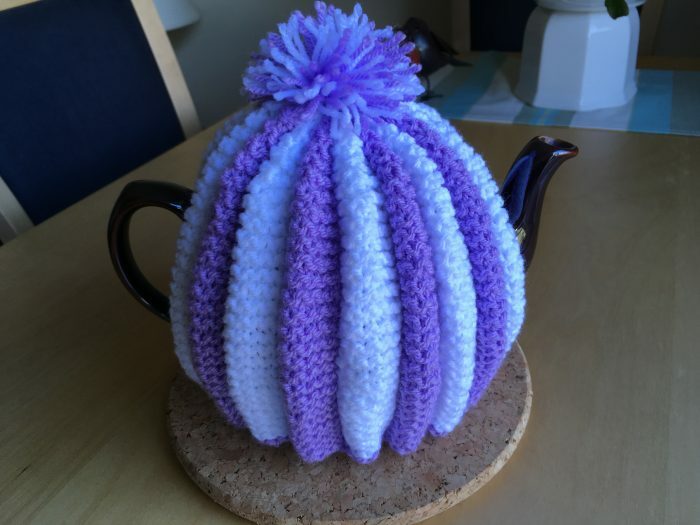 I made the middle size, the 4-6 cup, and it fits my Brown Betty teapot perfectly. Sadly, it is only a temporary pairing. The vintage-style cosy is destined for the Black Country Living Museum for the Summer Fête stall! Sometimes you see a project on Ravelry and decide to try it out, there and then! 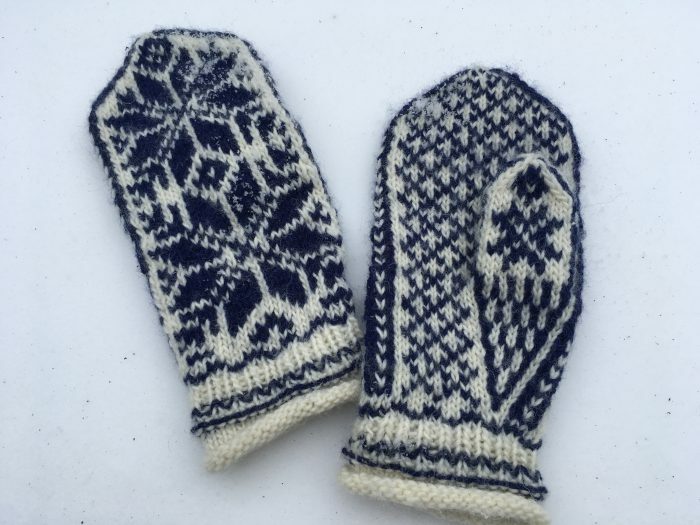 The Log Cabin Mitts pattern by Karen Templer of the Fringe Association was one such project. 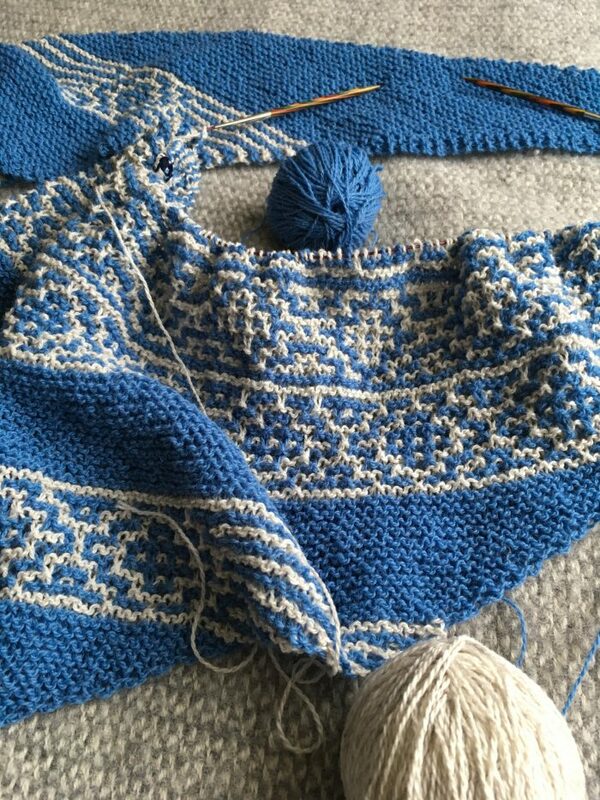 I had two part-skeins of Drops Nepal in my stash, so knitted the colour blocks in such a way that the yarn was evenly distributed. 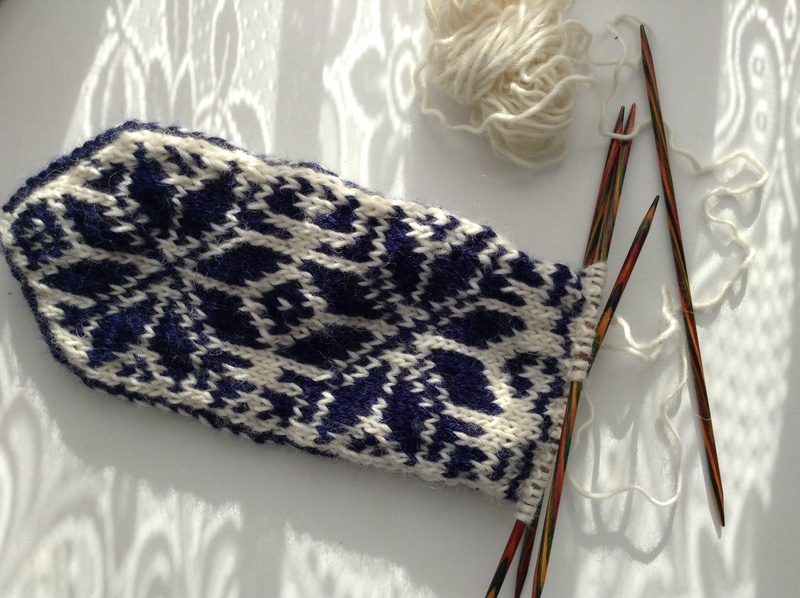 The original pattern shows lots of possible permutations, and you could use as many colours as you want. 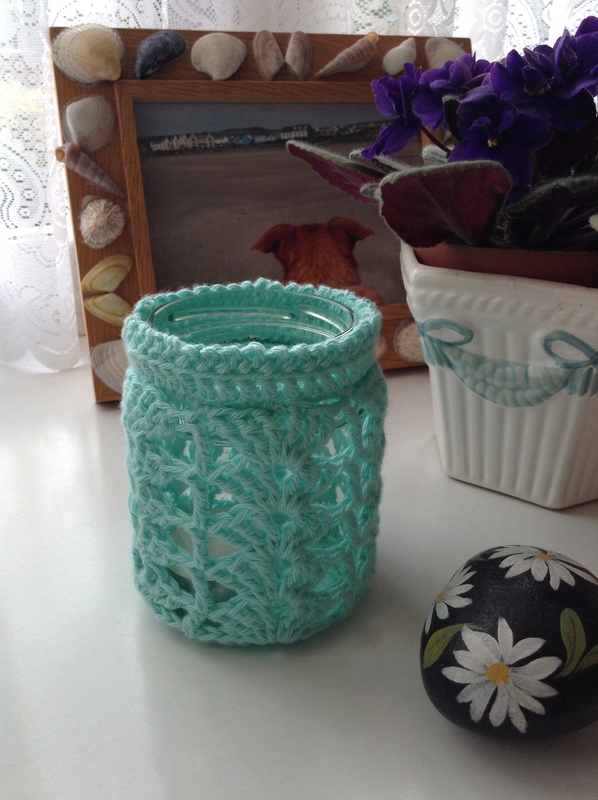 The pattern is free and I can definitely recommend it to you. Let me know if you give it a go! My decluttering has had its ups and downs, I have to admit. 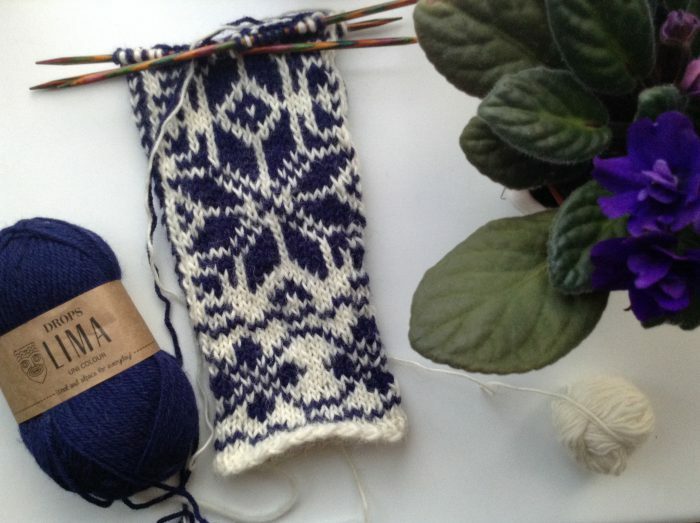 It’s a work in progress – much like my knitting! One of my rediscovered treasures was a video (yes, a VHS video) of Edd the Duck, recorded from the TV over 25 years ago. Why would I have recorded and kept this? After all, Edd was (spoiler alert!) 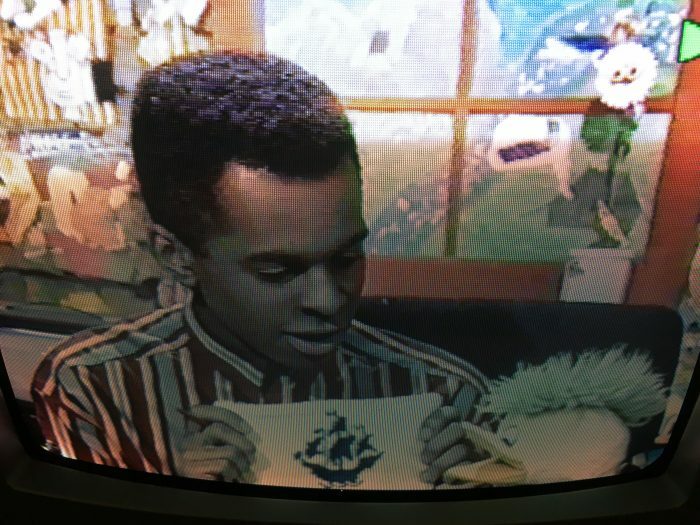 a hand puppet on Children’s TV, accompanying Andy Crane and Andi Peters in The Broom Cupboard, and appearing between the main programmes. 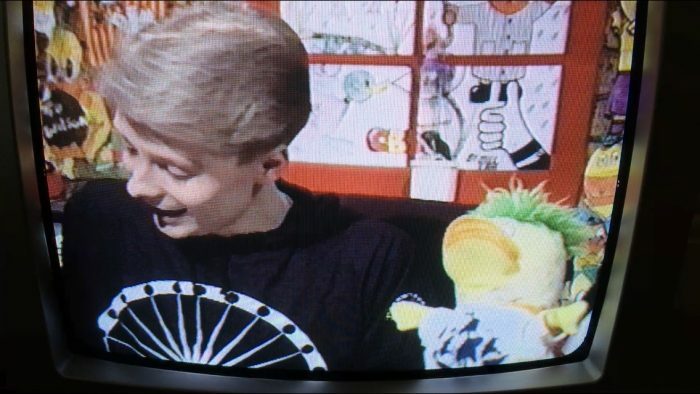 So that’s my claim to fame – Edd the Duck wore my jumper! 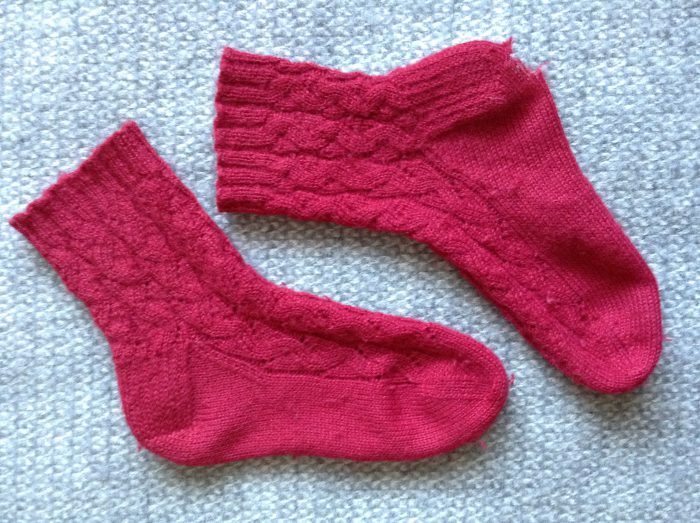 Have you taken a trip down knitting memory lane recently? I’d love to hear about it! In theory, the felt acts as a gentle exfoliator on the skin and also keeps the soap in shape longer, but I haven’t tested it out yet. The sheepy smell is quite strong when the felt is wet – I’m not sure that’s such a good thing when you’re trying to get yourself clean! 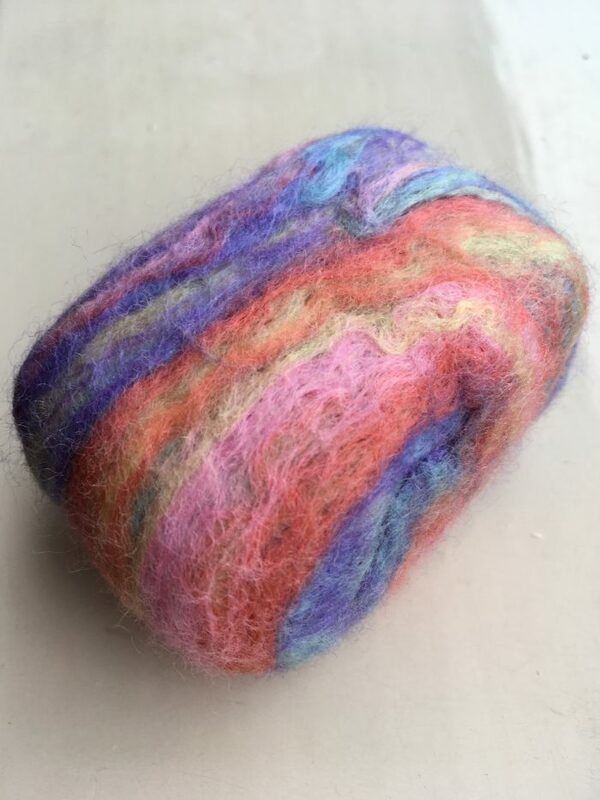 Have you made or used a bar of felted soap? What did you think of it? Do you like the idea? The heels have completely worn through, and the soles are thin, but I couldn’t bear to throw them away. They have more life in them yet! The surrounding fabric wasn’t strong enough for me to darn the hole, so I decided to have a go at patching it. 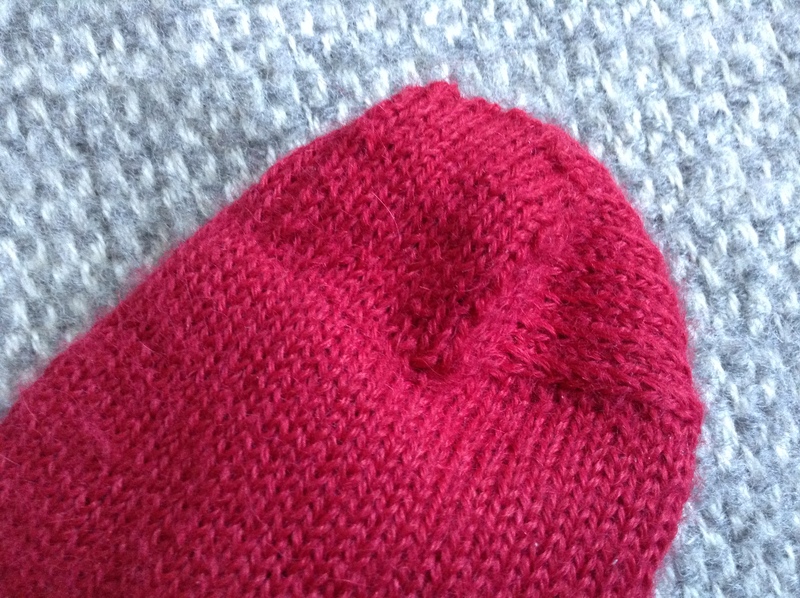 I picked up a few stitches, knitted a few rows to form a flap, then sewed the edges down to cover the hole. They won’t last forever, but they may now see me through the rest of the winter! Have you made any repairs lately? I’d love to hear about them! Take care, stay safe and happy knitting! 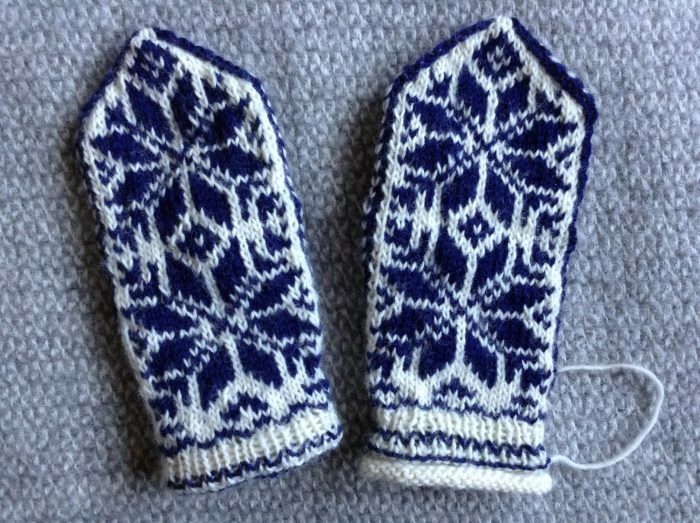 For some reason, the cast-on edge of my Selbu Mittens wouldn’t lie flat, and as I was working the rest of the mitten, it began to irritate me. I tried dampening it and leaving it to dry, but it still wanted to curl. I know life’s short and all that, but I also know that rolling edge would spoil the mitten for me. 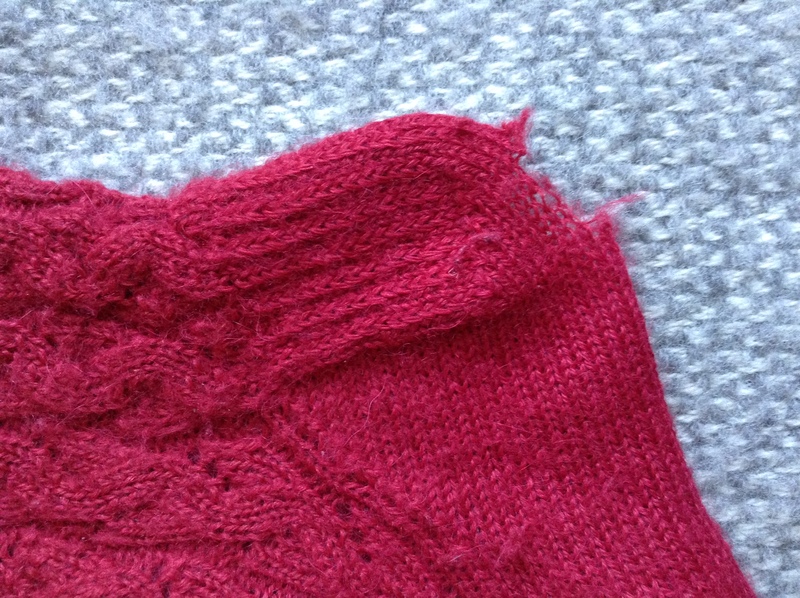 When I finished the top of the mitten, I tried it on for size and cut the cuff off at a suitable point. 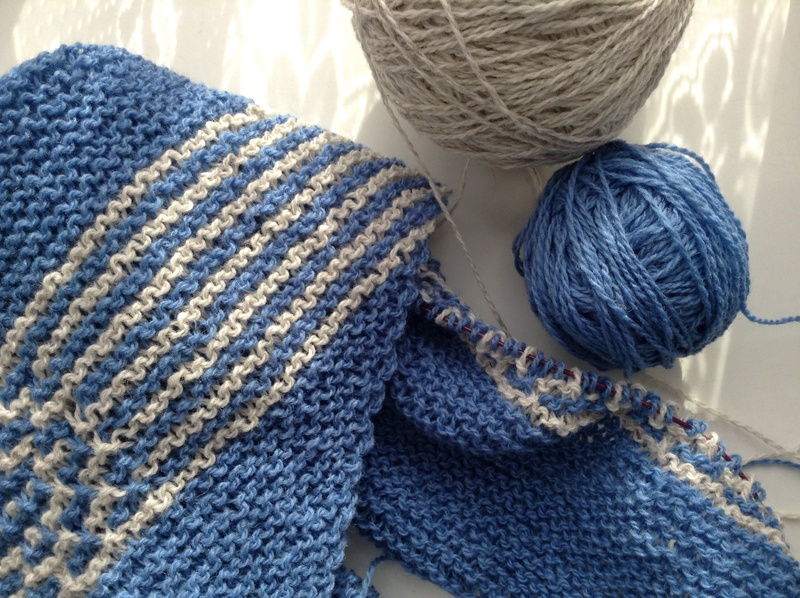 I re-knit a simple rib, adding a single stripe of navy and a purl row to act as a turning edge, followed by a few rows of stocking stitch to finish, which I am going to tuck inside and catch down, to form a warm, neat cuff. It will be quite a bit shorter than the original pattern, and that’s fine for me! 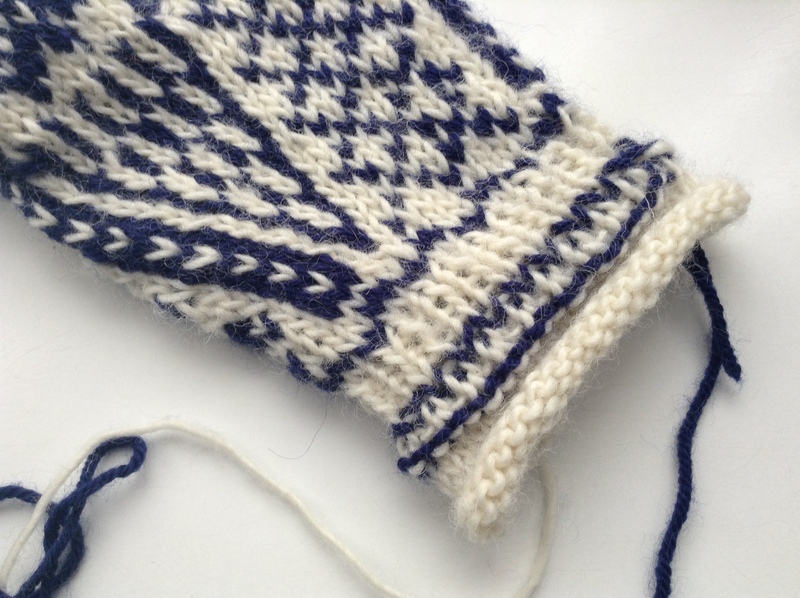 I have now started the second mitten, using a provisional cast-on at the point in the pattern where I cut the first cuff, so that I will able to replicate the improvised replacement cuff. 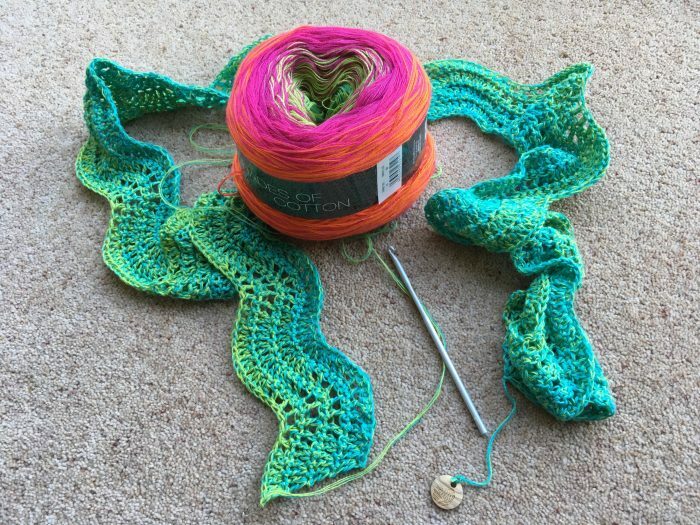 What’s the biggest alteration you’ve made to a pattern or project? I’d love to hear how it went! Have your creative juices been flowing this week? 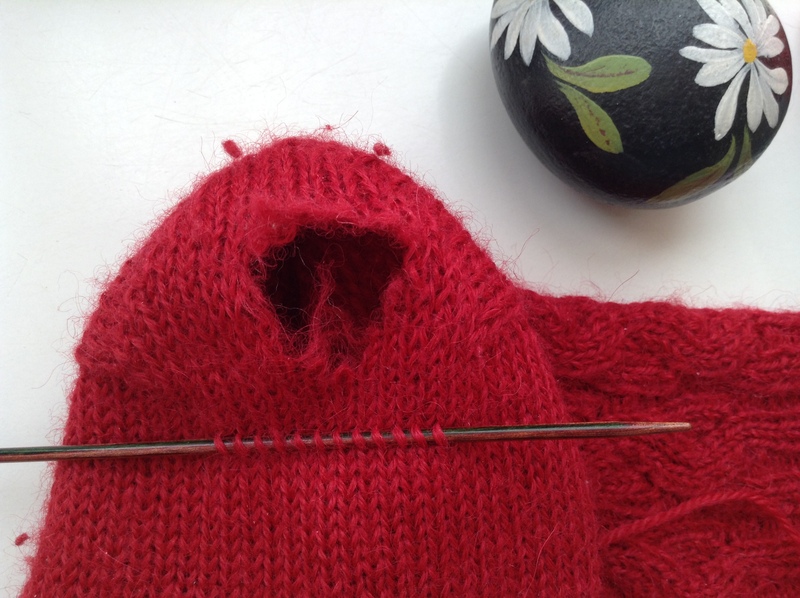 I’d love to hear what’s on – and off – your needles!